was born the son of a blacksmith in Nakamura, a village in Owari where supposedly the regent Toyotomi Hideyoshi was also born. 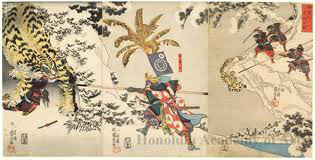 ... After Hideyoshi died in 1598, both Tokugawa Ieyasu and Ishida Mitsunari courted his support. 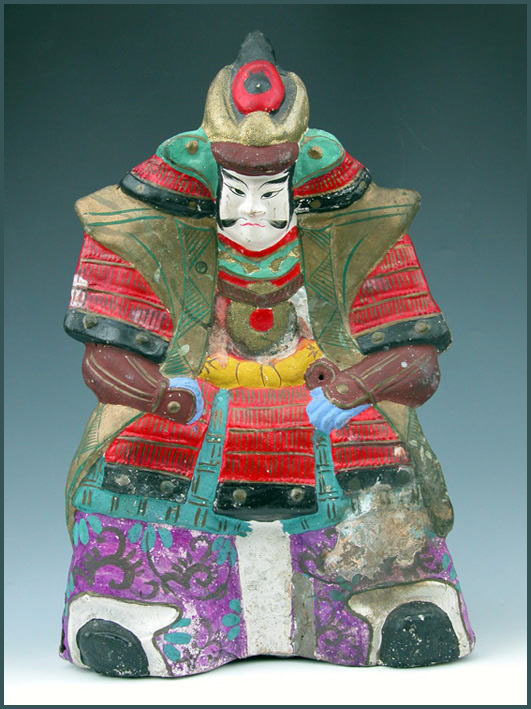 ... A ferocious fighter and often ruthless, Katô Kiyomasa was a warrior, nothing more, nothing less. He wrote to his followers later in his life that poetry and dancing were shameful pastimes for a samurai, and ordered anyone who found himself engaged in the latter to commit suicide. 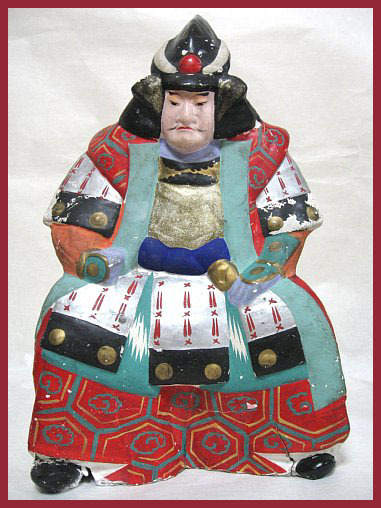 Kishokan　鬼将官, or, 'Devil General'. ... The Korean king Seonjo abandoned Seoul in fear of Kiyomasa. Kiyomasa held two Korean princes who had deserted as hostages and used them to force lower-ranking Korean officials to surrender. 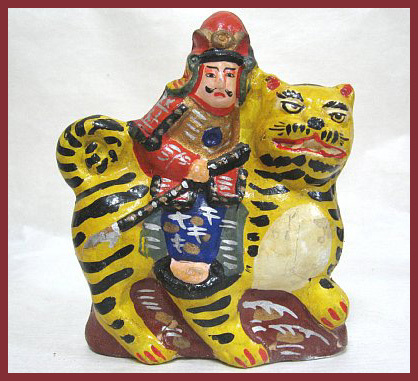 Kiyomasa killed a tiger while hunting in the forest and presented the skin to Hideyoshi. 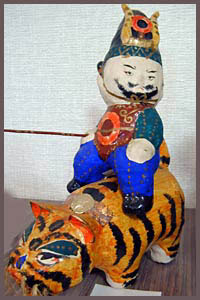 One of his concubines in Korea had been attacked and eaten by a fearful tiger. Kiyomasa got so angry, he took his long spear and killed the tiger in revenge. The people of this village in Korea where very greatfull for this deed. This act of bravery was often told to the samurai of Japan. 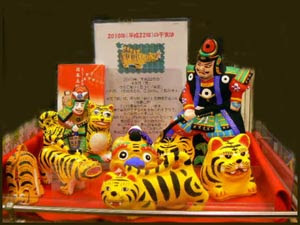 During the Morioka festival, floats of Kato Kiyomasa and Watonai 和藤内 are very popular.
. Watonai (Koxinga) 和唐内 / 和藤内 and Tiger Toys . ... The single-sided sickle spear had a radical weapon design sporting a blade that was two-pronged. Instead of being constructed like a military fork, a straight blade (as in su yari) was intersected just below its midsection by a perpendicular blade. This blade was slightly shorter than the primary, had curved tips making a parallelogram, and was set off center so that only 1/6 of its length extended on the other side. This formed a kind of messy 'L' shape. ©　More in the WIKIPEDIA about spears !
. 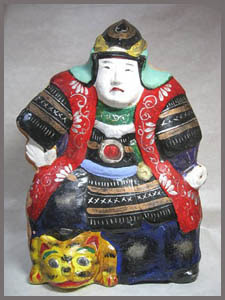 Shibahara tsuchi ningyoo 芝原土人形 Shibahara clay dolls .
. Clay dolls from Hyogo　兵庫県　土人形　. 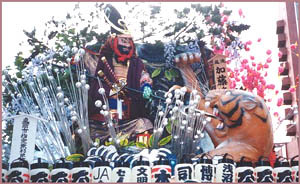 This set was decorated for the Boy's Festival.
. . . CLICK here for Photos of Kiyomasa dolls!
. Kites with Daruma .
. Tora トラ　- 虎　- 寅　Tiger Toys . Horse meat was given to the soldiers by the warlord Kato Kiyomasa, when during the fight of Keicho in 1597 (Keichoo no eki 慶長の役】) all other meat and food was eaten and they had to slaughter the riding horses to keep alive. Up to our day horse meat 馬肉 is eaten in Kumamoto. DON is the local word for SAN, Mister.
. Shiro - Japanese Castle Legends　お城と伝説　. One legend from Kumamoto and Fukuoka in Kyushu knows that the Kappa clan once lived upstream of the Yellow River in China and one of their groups made it all the way to Kyushu to the river 球磨川 Kumagawa in Kumamoto. Their offspring soon counted for more than 9000 (九千坊 Kusenbo / Kyusenbo, also the name of their leader). 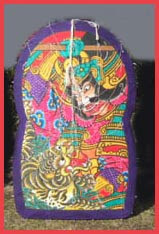 They became the 九千坊 Kyusenbo clan in Kyushu and it was 加藤清正 Kato Kiyomasa who called on the help of the Monkeys of Kyushu to fight them (Monkeys can see a kappa, even if he is invisible to the human eye). When Kato Kiyomasa built the Kumamoto Castle, there was a popular foot soldier named Kinta who had a funny face and who was good at making people laugh. He was affectionately called “Clown Kinta”. The "Kinta the Ghost" toy was said to have been created during the Kanei era (1848 ~ 1853) by a doll maker, Hikoshichi Nishijinya 西陣屋彦七, who started making mechanical toys based on stories about Kinta. On his way to war in Korea, 加藤清正 Kato Kiyomasa asked the Ushioni to come with him and fight. In the town of 宇和島 Uwajima at 泉ヶ森 Izumigamori there is Ushioni-Zuka 牛鬼塚 a mound in his memory. Once upon a time, when Okuninushi drove out the demons and also Ushioni, his blood turned the ground all red, and even now there are 赤石 red rocks. There are also families named 鬼塚 Onizuka and 鬼頭 Onigashira .